Already part of a wedding party? Log into our Virtual Showroom! Jared and I have always known of each other from living in the same town (Madison, MS). It wasn’t until our mutual friend’s 20th birthday that we really started hanging out. I lived in Starkville, MS and went to MS State; he lived in Oxford, MS and went to Ole Miss. 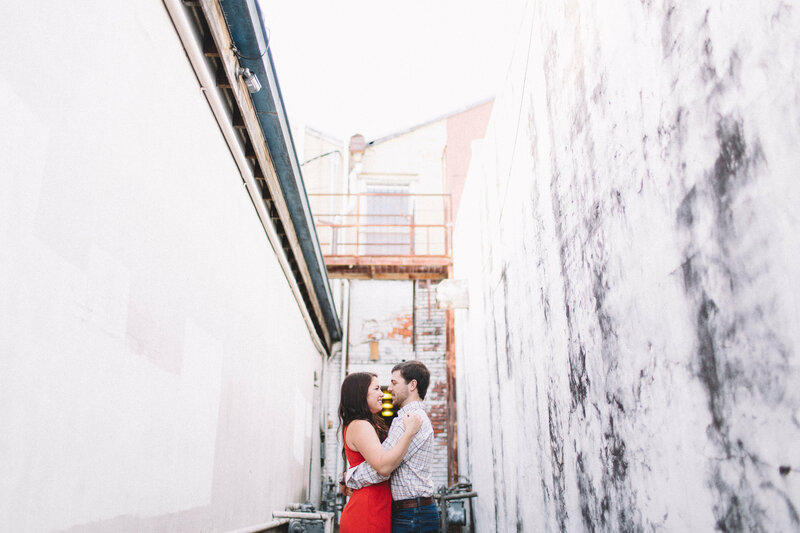 We saw each other here and there, but he asked me out on our first date that next summer. We were inseparable after that. We had been together 6 years by this time. It was Christmas time, and he was about to graduate with his second degree so I had a feeling it was coming. We went on a trip to Memphis with his parents for a Trace Adkins concert. I was sure he was going to propose then. We were waiting for the show to start at the Orpheum, and he could tell that I was upset that it hadn’t happened yet. He leaned over and told me that he had bought the ring; that he couldn’t keep it a secret from me. His only request was that I wait a little longer, because my mom didn’t want the proposal to be during Christmas. I was working that day. I am an RN so I usually am nasty and super tired by the time I get off. I called Jared to see what we were doing that night. He said that his parents were cooking my favorite meal and wanted me to come over. He also asked me what wine I wanted to drink. I told him I had to work the next day and didn’t want to drink. He insisted that I have only a glass. I knew instantly what was happening. I get to his parents house, and no one is there except him. He said his parents decided to go out to eat instead. He led me upstairs to the guest bedroom where my complete wardrobe (basically my entire winter line and shoes), all my hair products, make up, and jewelry were waiting for me. He told me to get dressed and meet him downstairs. When I was ready, I walked down stairs were he had prepared my favorite dinner: Tuna, greens beans, and eggplant. When we finished, he led me outside his parents boat dock. There were twinkling bistro lights everywhere. He then got down on one knee and asked for my forever. Of course I said yes! We then went inside where our families and my two longest friends were waiting for us. Providence Hill Farm is a local Hunter and Equestrian facility. 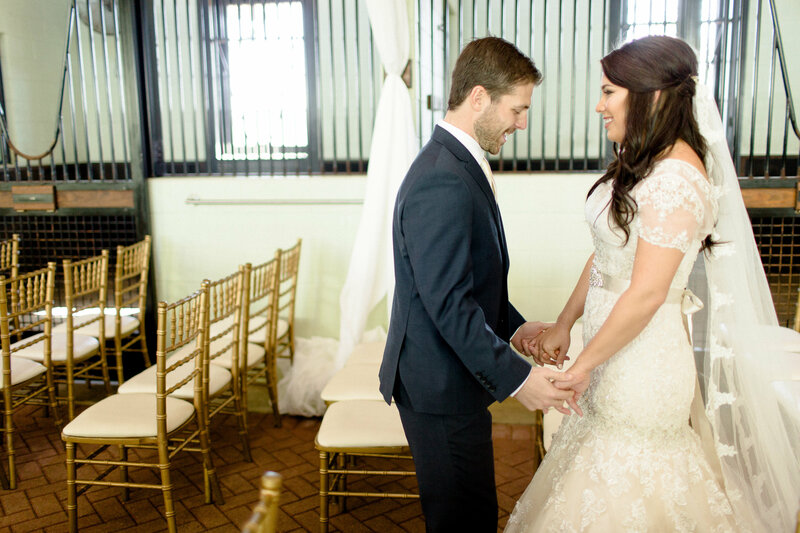 My best friend got married here a couple years ago on their pier by the lake, and I immediately fell in love with the stables which is where we got dressed for her wedding. 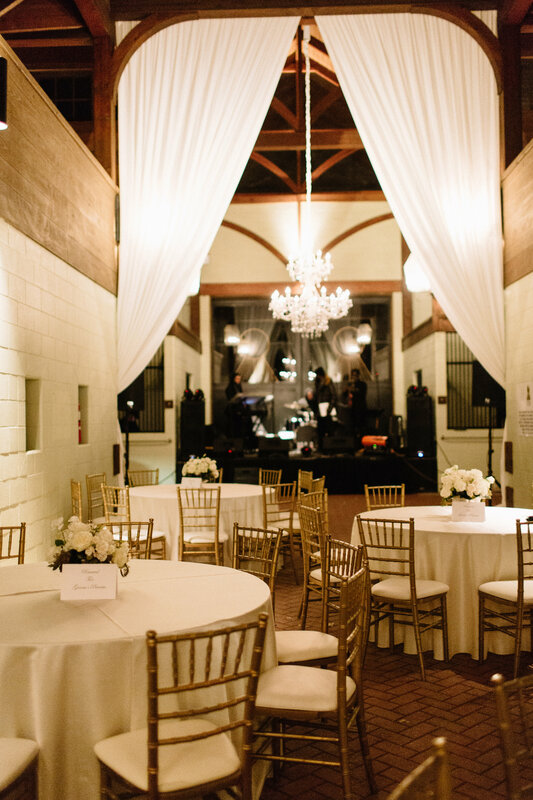 We wanted to get married in a church, but a lot of our local churches either had too much of a contemporary look (like a movie theater) or you had to be a member of the church to use the sanctuary. 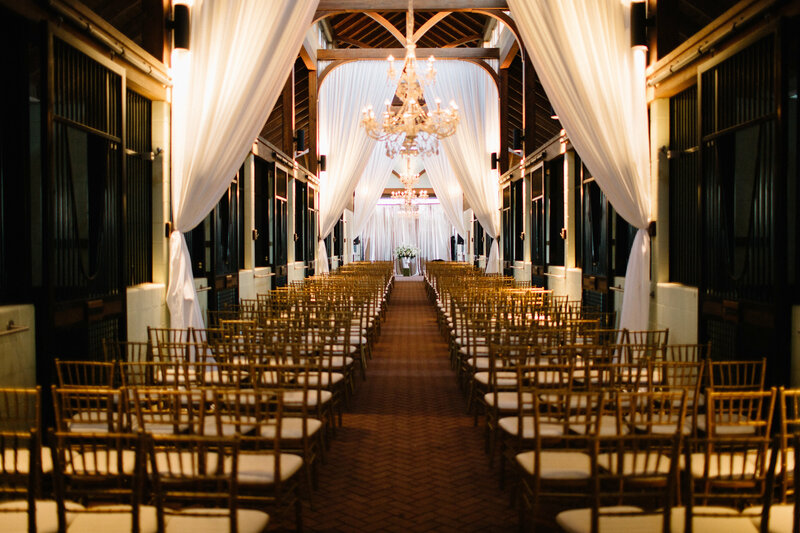 Providence Hill is located a good distance from town so it was just logical to do both ceremony and reception in such a beautiful location that I could mold into my dream wedding. 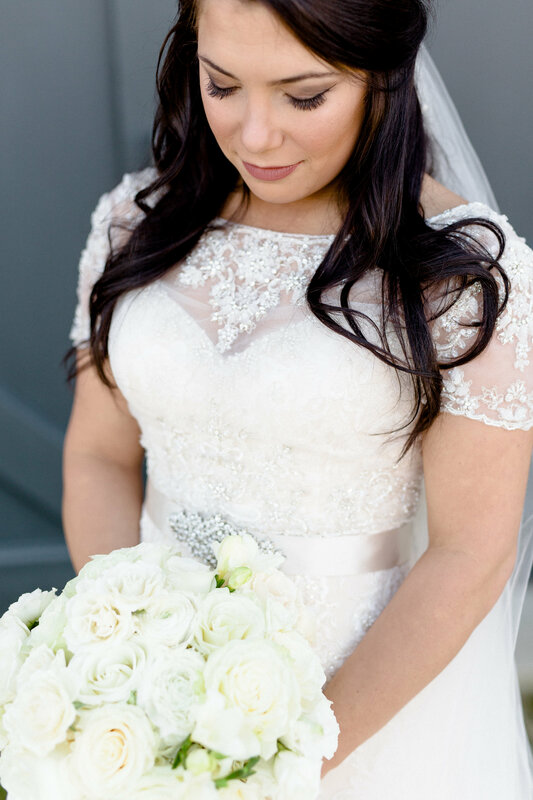 I wore an Allure Bridal gown that I bought from a local boutique called the Bridal Path. 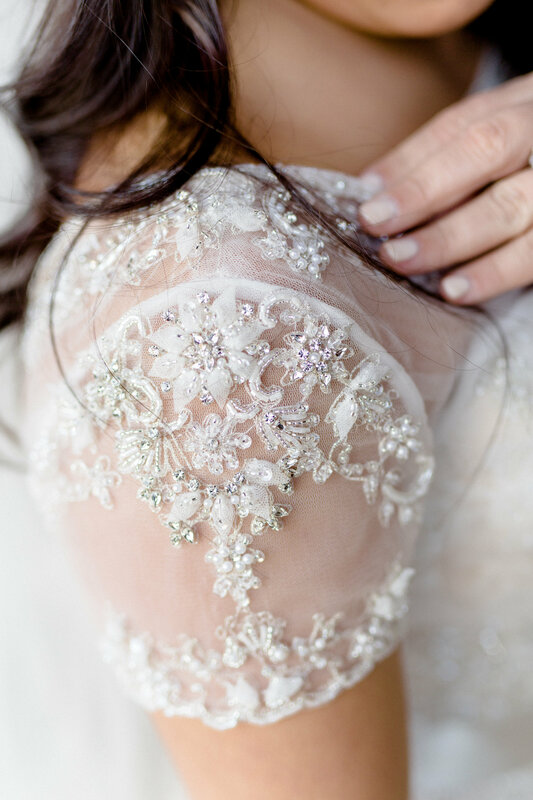 I wore an embellished short sleeve jacket over the sweet heart neckline. I also wore cathedral length veil that both my sisters wore in their weddings along with a party belt that one of sisters wore in their wedding. I started out wanting just gold and ivory everything. That quickly turned into ivory and metallics. I wanted mercury glass, gold candelabras, sequin table cloths (those were a must have) and crystal chandeliers. 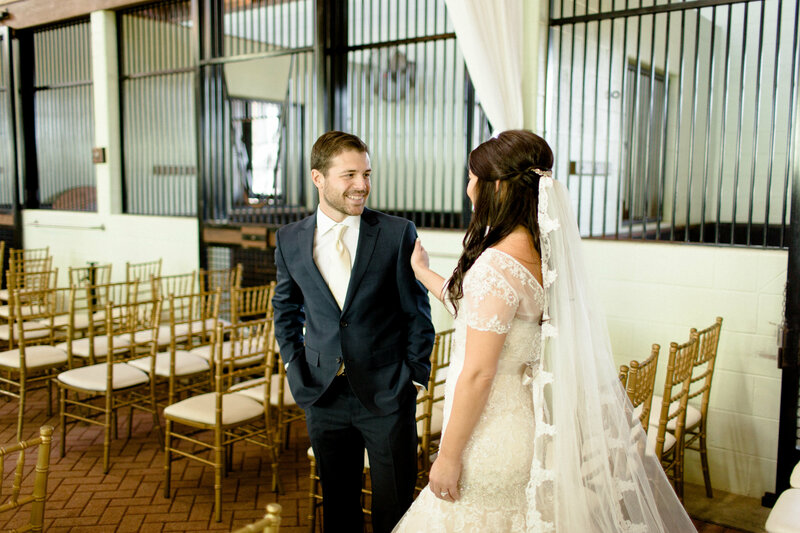 The ceremony and reception both took place in the stables, and I was adamant that I didn’t want this to be a rustic wedding. I wanted a elegance, glamour, and classic but with a twist of new age style. Being that Jared and I were together 6 years prior to this wedding, I have had a LONG time to dream about what this day would be for us. 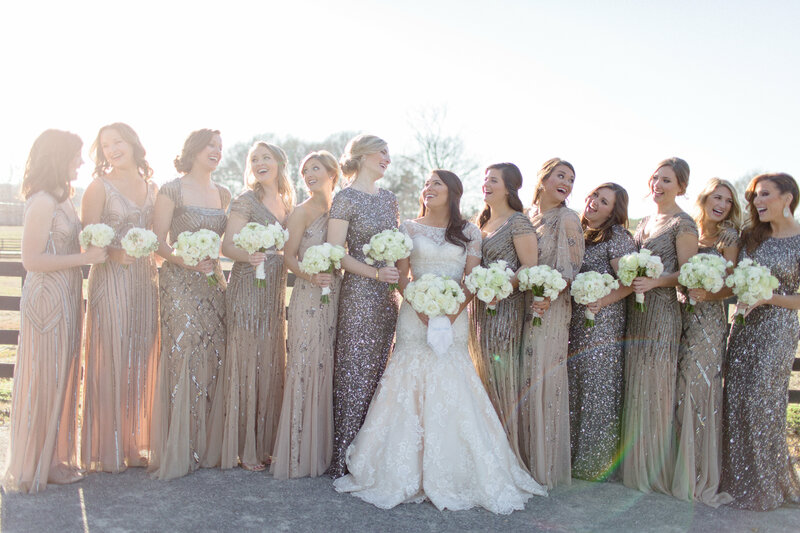 If you ask Katy Barham (owner of Bella Bridesmaid Jackson and also a friend of mine), she’ll tell you I have had these bridesmaid dresses picked out for years. Adrianna Papell is favorite of mine; I just love all of her styles. I am obsessed with each and every dress. I was happy when we put the four together and they just looked so perfect. We originally had not planned to put the slate dress in the mix; I just wasn’t sure about it. 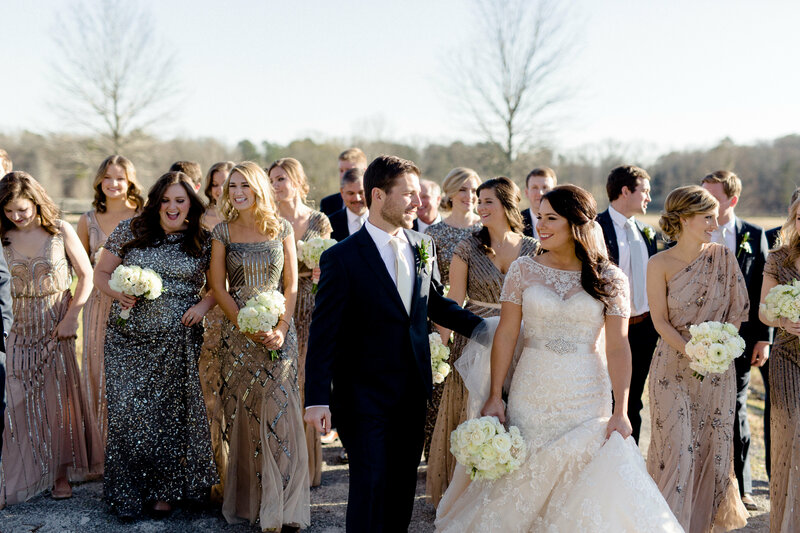 I am so glad we added it, but that dress was the favorite of all the bridesmaids. They all wanted to wear it. A good band: Jared has never been a dancer. When we first started dating, he would never dance when we went to date parties. It wasn’t until about two years into the relationship that we went to a wedding down in Seaside, Fl that we had our first dance. The band at the wedding was a motown band called the Compozitionz. Jared had me twirling all night on the dance floor. Small World: Jared began talking to one of their singers, and they happened to be from our hometown. Jared said then and there that they HAD to be our band when we got married. Not even two weeks after the proposal we booked them. 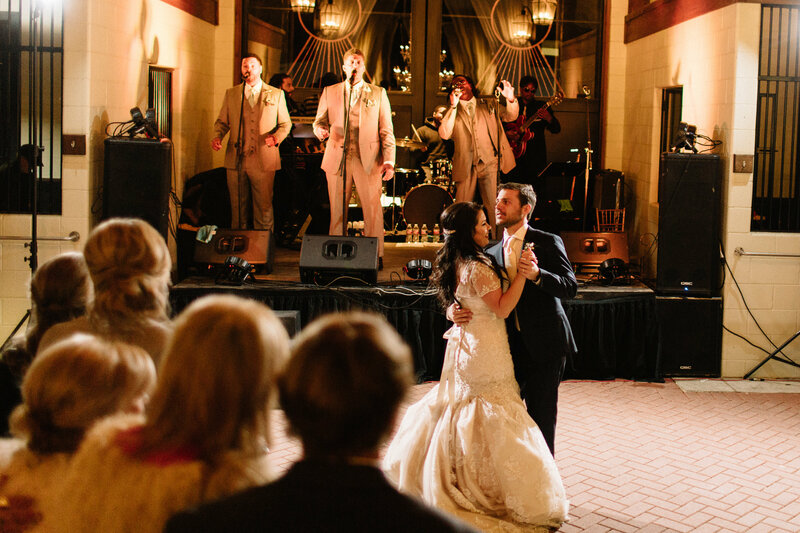 They had us dancing and singing all night. They even have choreography to go with their songs, and it really gets the crowd into it! First Look: the first look before the ceremony just gave us time to soak in what was happening and just have a moment between us before everything really got started. I was so frazzled the whole day with emotions and taking that time to be alone together (after the pictures of us seeing each other for the first time that say) really helped calm me down. 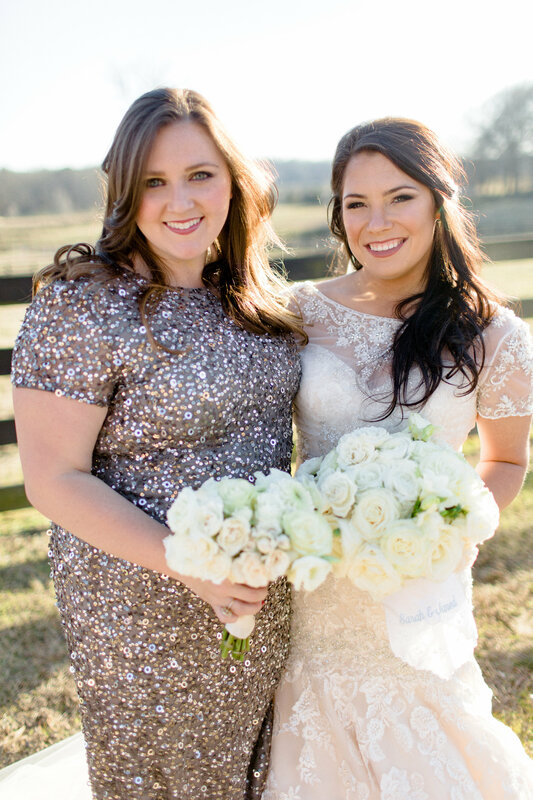 Wedding Stylist: This is where I got real lucky because my wedding stylist also happens to be one of my best friends. Emily Sanders with Confete Events is someone I met in college when I started dating Jared; so she’s been there since the beginning. This wedding has been many a time topic of late night wine conversations. I myself have a hard time projecting my style into real time. She knew my likes and dislikes and helped me out along the way to make sure every detail was exactly how I wanted it to look. 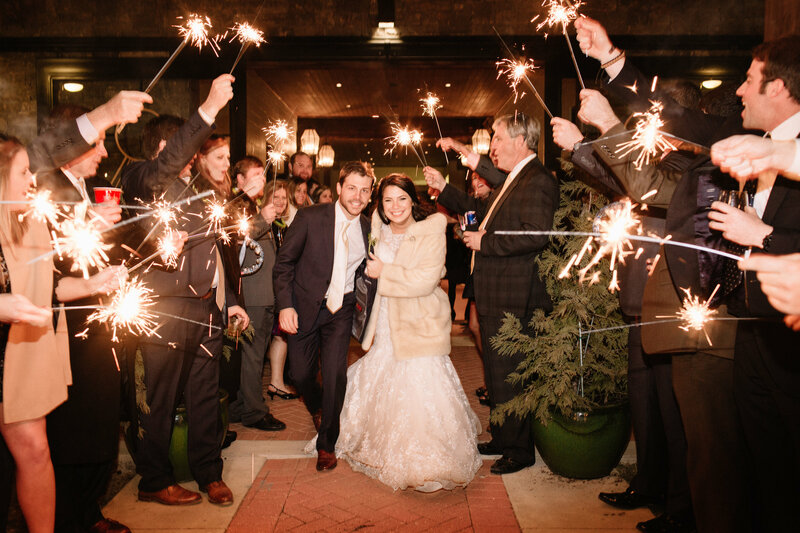 Sparklers: I mean they are so fun and looking AMAZING in the getaway pictures! 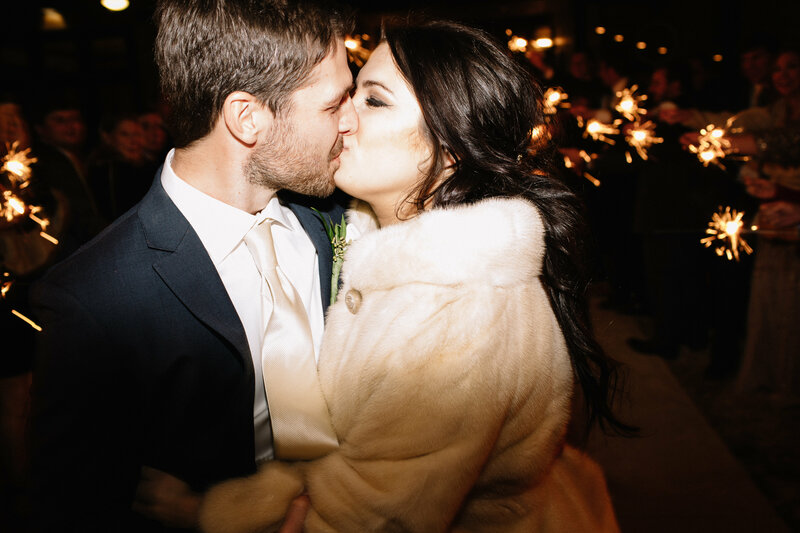 Anything I would do differently: Honestly, I was so so so lucky that nothing went wrong on my wedding day. It was literally perfect and I wouldn’t do anything differently. My advice to any bride is to just remember to sit back, relax, and soak everything in while it is happening. It just goes by so fast. I actually started crying at the end of the night (could’ve be the Chardonnay talking) because I did not want it to end so fast! The whole day was my favorite memory. I cannot pick one single moment that was better than another. We were surrounded with our family and friends, and it was literally that BEST DAY EVER! A Jaw-Dropping Joanna August Promo! Set the Tone in Amsale Spring 2019! DASH FOR THE DESSY FLASH SALE! 5 for $15 in July! New Bella Exclusive Styles by Monique Lhuillier! Dessy & Bella Exclusive Collection! 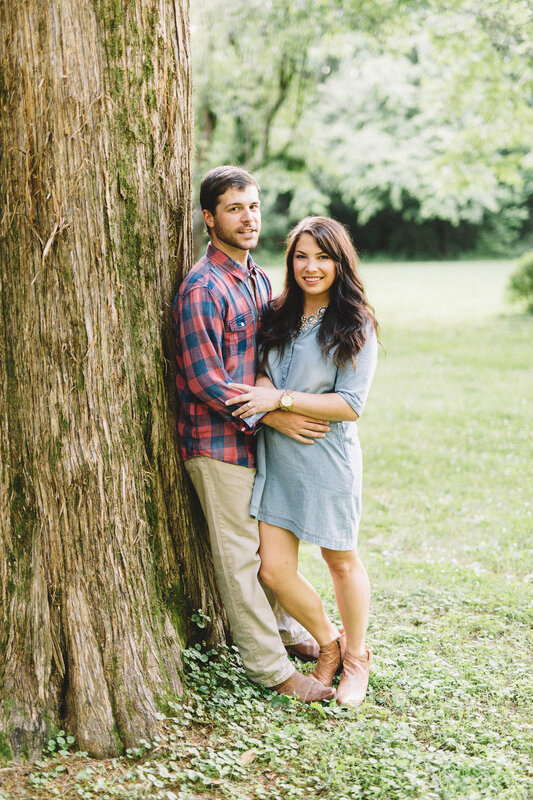 Our Love Story with Joanna August! Jenny Yoo 2018 has arrived! It's a Hayley Paige Parade! It's a twobirds Velvet Revolution! Set the Tone in the new Amsale Fall 2018 Collection! Center Stage with Joanna August! How to be a Bridesmaid Shopping All Star! 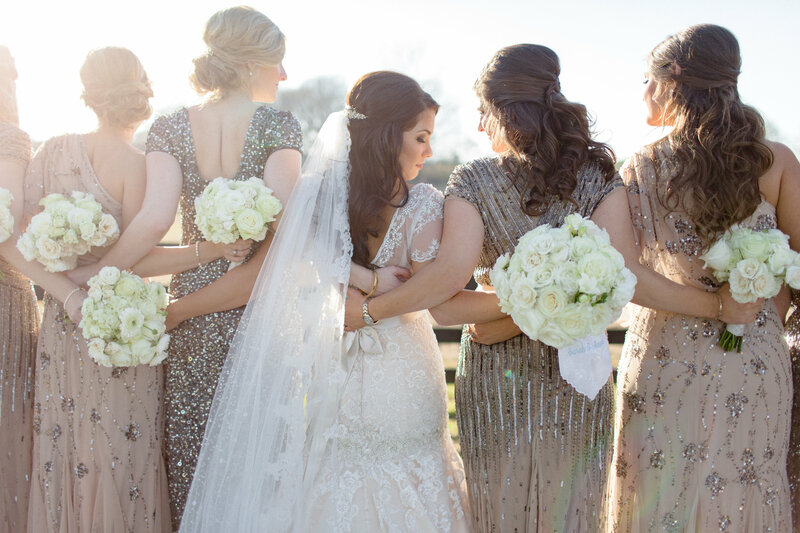 Separate your bridesmaid look from the rest with Separates! Bella Bridesmaids loves a wedding! We have the largest collection of bridesmaid dresses from the world’s leading designers in our Bella Showrooms. With hundreds of dresses to choose from, your personal Bella stylist is ready for anything. © Bella Bridesmaids Franchise Group, LLC.